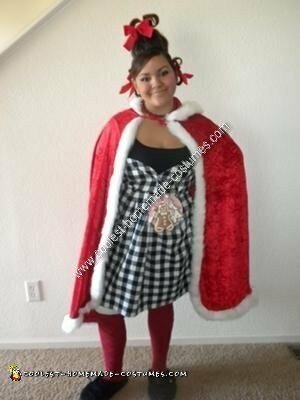 The hardest part of this cute Homemade Cindy Lou Who Halloween Costume is finding all the pieces to make it as authentic as possible and still remaining within budget. If you start early enough most items can be found at a second hand store or borrowed from friends/family. 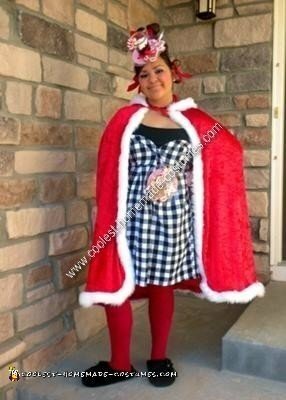 The key pieces are the plaid dress is used to give the table cloth look with a plastic plate filled with goodies attached with Velcro and the red Christmas cape; used a red cape from a previous costume and just added the fur…. 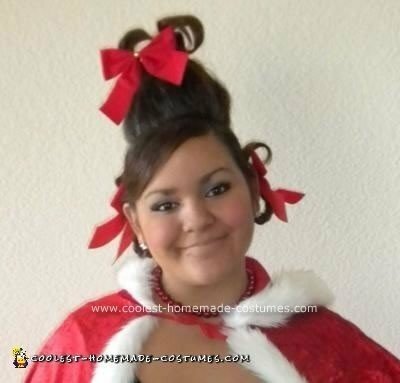 Most challenging was the hair, my daughter is not blonde but with the right touches she clearly is a “Who”…because her hair is very thin and fine I did not want to damage her hair with a lot of teasing so I just piled a few hair rollers in a pyramid on top of the head and covered with her own hair. 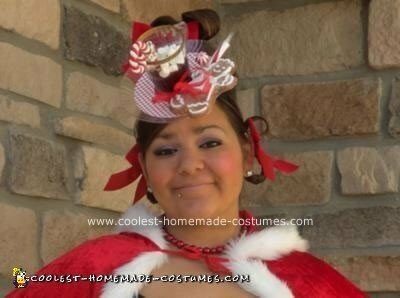 The completed costume was achieved with the final touches, black furry slippers, red stockings, pink gloves, string of red beads for the choker, red ribbons for the hair and the head band complete with cup of coco, candy and cookie!